When we hear 3D modelling, we tend to think either that the model was created by hand in something like AutoCAD or by scanning an object with lasers to get its exact dimensions. But there are actually a number of different ways to make a 3D model, each of which are suited to different needs. Laser scanning is probably the most well-known technique because they are usually used when modelling landscapes, monuments and buildings. There are a few ways to laser scan an object, but larger scanners tend to operate using time of flight while smaller handheld scanners use triangulation. Time of flight works a lot like echolocation—a laser is fired at a surface and the time it takes the laser to travel back to the sensor indicates the distance of that surface point from the sensor. Do this enough times on enough points around the object and you end up with enough points for a model. Smaller handheld scanners use triangulation instead. I am no specialist in trigonometry, but here goes an attempted explanation. A triangle is set up between the object, the laser, and the sensor. We know the distance between the camera and the laser (a), the angle of the camera to the object (x), and the angle of the laser to the object (y). 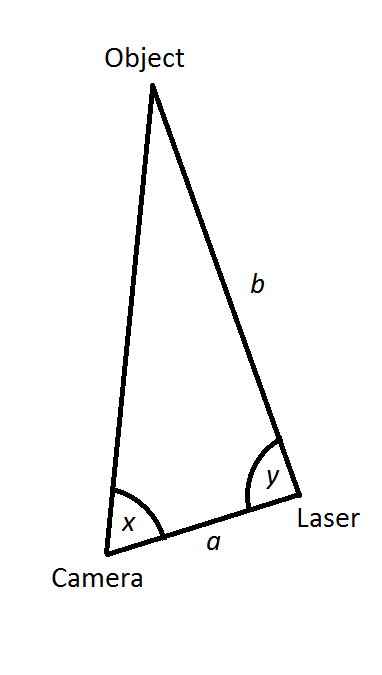 We are trying to find the distance between the laser and the object (b), which we can do using trigonometry. So we know the side a and angles x and y. We also know that the tangent of an angle equals the length of the opposite side divided by the length of the adjacent side. Therefore: So let’s say the angle of the camera to the object (x) is 60 degrees and our camera is 10cm away from our laser. The distance of the laser to the object is 10 x tan(60) = 17.32cm. 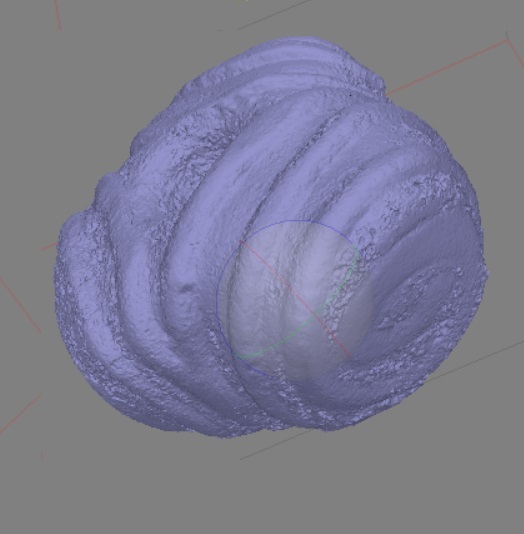 Once the scanner measures enough points this way, they can be used to create a 3D model. Structured light scanners work a little differently. These scanners capture numerous images of an object while projecting specific patterns of light onto it. The distortion of the light between images allows the scanner to calculate three dimensional data for each point. Because these scanners are capturing images, they also collect colour and texture data rather than just shape, which makes them relatively popular for creating models of objects. X-ray computed tomography is more commonly known as CT scanning, and it can be used to create 3D models. This works by taking numerous x-ray images of an object at various angles, then combining them to create images of various cross-sections of that object. Those cross-sections can be stacked on top of each other to create a 3D model. This is often used in medicine, but I’ve also seen it used in archaeology. While laser scanning is probably the most well-known, photogrammetry is the technique that is most accessible. It’s also what I tend to use. There are several ways to do this, but the most common is Structure from Motion or SfM. In this technique, a person takes numerous pictures of the object, making sure they overlap by at least 40% (though closer to 60% overlap often works better). These images are then combined in various software programs and three dimensional measurements are calculated based on where the images overlap. These points can then be combined to create a 3D model. The great thing about photogrammetry is that it can be done using any camera – your phone, your GoPro, your dSLR, anything. There are apps for it, with 123D Catch being one of the most popular. So if you’re wanting to give 3D modelling a go, try out the app (or any other ones out there) and see what happens. This entry was posted in Heritage Visualisation, Technologies and tagged 3D, archaeology, bead, laser scanning, methodology, modelling, photogrammetry, structured light scanning, technique, technology. Bookmark the permalink. How well does photogrammetry work on clear (semi-transparent) objects? Ah, see, there’s the rub – not terribly well, but better than a lot of the other technologies. I’m going to do another post soon about why I’m using (or not using) these techniques in my own research. For now, though, the general answer is that most people will say it doesn’t work at all. My PhD is trying to find ways to make it work, and I’ve has a certain amount of success, but not with monochrome clear objects quite yet.